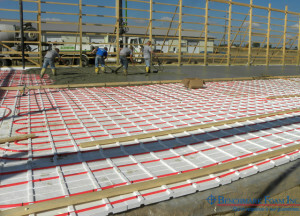 For years, customers have relied on Benchmark Foam for high density, high performance expanded polystyrene (EPS) insulation for underneath hydronic-heated slabs. Within the last four years, more than 11 million square feet has been installed. R-10 requires a slightly thicker EPS insulation, so make sure to plan for that thickness to ensure adequate slab thickness. The added thickness of the insulation significantly enhances strength and durability during installation. Pricing for Benchmark Foam’s R-10 compatible products are competitive to others in the marketplace. However, when you don’t order from Benchmark Foam, you miss out on experiencing the superior quality products from the most responsive EPS foam manufacturer in the industry. Call us at 800-658-3444 or 605-886-8084 for a free quote for your next project.